MAT stands for multifocal atrial tachycardia. PAT stands for Paroxysmal atrial tachycardia. A student going through drbeen’s EKG interpretation lectuers asked us the difference between MAT (multifocal atrial tachycardia) and PAT (paroxysmal atrial tachycardia). PAT is usually an extra focus/reentrant circuit in the atria. It is similar in pathology to PSVT but the location could be anywhere instead of near the coronary sinus (study our lecture on atrial flutter.) Due to the focus being away from the SA node, the P wave’s shape can be different but consistent. Usually, there also is a warm-up and cooling-down period. MAT is due to many reentrant circuits (but not as many as in the atrial fibrillation). Because of multiple foci present in many locations in the atria, you will find P waves of many shapes. 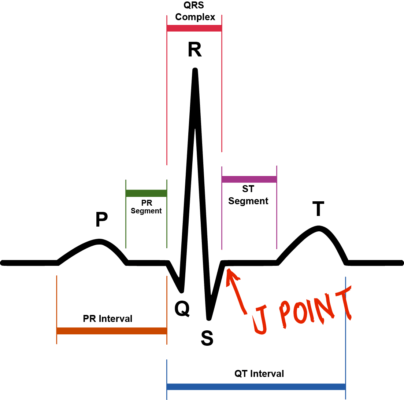 To diagnose a MAT you must identify three different shapes of the P waves in the EKG. MAT and PAT both have the common presentation of 100 to 200 bpm heart rate.